1. Click the Share & Export icon or the Sharing menu item to start. 2. Select the collection to be shared and the groups with who you will share it. Remember, when you share a collection any sub-collections are also shared. 3. Type the email address of the person (add one at a time) and select the level of access for the person you're inviting. 4. Optionally, add a personal note. If the person you are sharing the collection with does not have a RefWorks account, they will be asked to create one. To view what collections you have shared, look for the sharing icon next to the collection name. 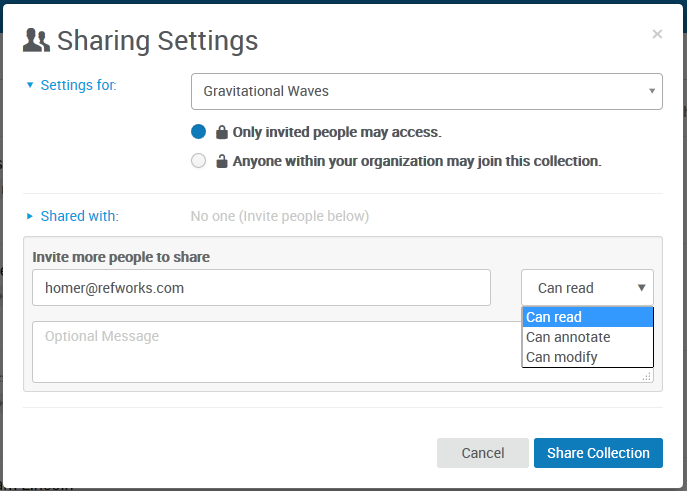 By selecting Sharing Settings from the menu, you can access the settings for your shared collection to modify them. remove individuals from your collection by clicking the "x" to the right of each address in the list. Google makes it easy to collaborate with others on your paper. Now you can take that a step further, by collaborating with other RefWorks users! Share your Google Doc with anyone who has a RefWorks account and in addition to adding and editing text to your document, they can also add in-text citations and footnotes from their RefWorks account. 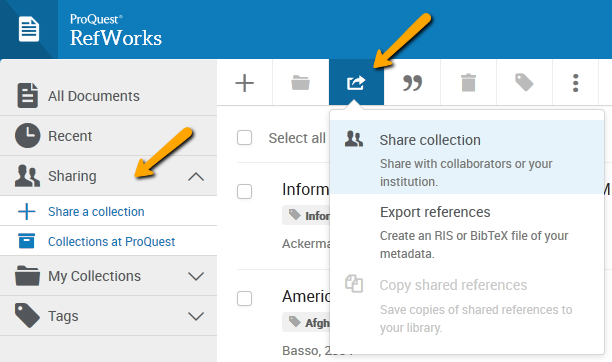 You can even collaborate using the same set of references by sharing your RefWorks collection with your collaborators. Note: Anyone you share with can also delete in-text citations you’ve included in your document, however, they cannot delete references from your RefWorks account.